In the realm of Instagram, Diet Prada has served as the literal fashion police, calling out designers for stealing other people’s work — everyone, from Christopher Bailey, Maison Margiela, Virgil Abloh, and Supreme have not been able to escape them. One of the latest, and most ironic posts to make their grid is a photo comparing Diet Prada merch to a recent Dolce and Gabbana shirt. 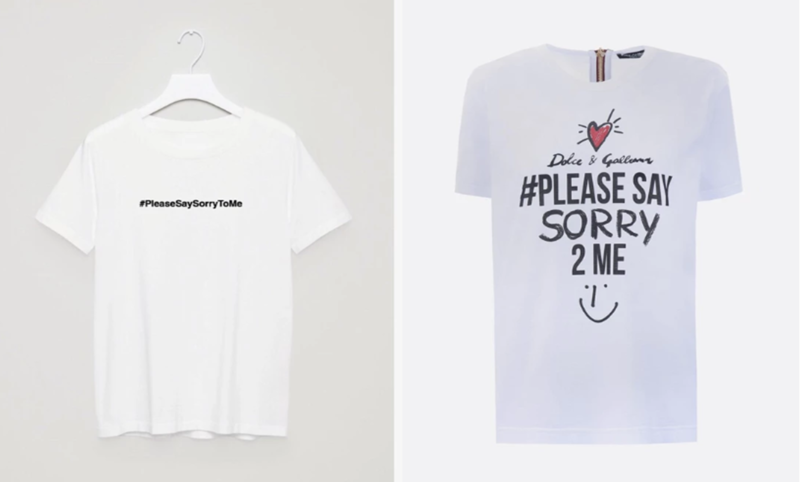 Both tees read “#pleasesaysorrytome,” which if you haven’t been following, is a reference to on-going drama between Stefano Gabbana and Diet Prada. The story goes back to last October, when the users behind Diet Prada posted a photo of a Dolce and Gabbana display next to a Gucci x Gucci Ghost one. Stefano being no stranger to controversial Instagram comments, had responded by calling them idiots, and starting the hashtag #pleasesaysorrytome, which Diet Prada later printed on a T-shirt. Dolce’s response to this move, was to make their own version for $481 USD, which inevitably ended up on Instagram. How Stefano will respond this time, we’ll have to wait to see.